You've got your beach towel, your bikini body and a cooler filled with snacks. You're ready for the beach — but hold up! Did you remember your sunscreen? Sunscreen should be an everyday fixture in your beach bag. But what about the rest of the year? Do you remember to wear sunscreen when you walk the dog? When you go for a run? When you’re sitting next to the window in your office? Whenever you expose your skin to the sun, you can’t forget the importance of sunblock. Let’s take a look at why it’s important to protect your skill with an SPF all year long. Why is it important to use sunscreen? We’re constantly reminded to wear SPF, but why is sunscreen important? Sunscreen protects us from the sun’s harmful ultraviolet rays: UVA and UVB. UVB rays are responsible for sunburn. It’s very easy to see — and feel — the effects of UVB rays. UVA rays, on the other hand, penetrate deeper into the skin. These rays can lead to long-term effects like wrinkling, premature aging and other skin damage. Both types of ultraviolet rays can cause skin cancer. According to the American Academy of Dermatology, skin cancer is the most common form of cancer in the United States. One in five Americans will develop skin cancer before the age of 70. Applying sunscreen daily drastically decreases your chances of getting skin cancer. So how does sunblock work? Sunblock creates a shield to prevent UVA and UVB rays from reaching the skin and keep it safe from the harmful effects of UV radiation. Most products do this by absorbing, scattering or reflecting the light. The earth has a natural shield, too: the ozone layer. The ozone layer protects the planet from most of the sun’s ultraviolet rays. However, the ozone layer is not as thick as it once was. This means we have less natural protection from UVA and UVB rays. In fact, using sunscreen is more important today than it ever was before. Is sunscreen good for your face? Of course! Sunscreen all over the body is important, but the face is particularly susceptible to wrinkles and premature aging. No one wants to look older than they are, and sunscreen plays an essential role in anti-aging. Keep in mind that the importance of sunscreen on face isn’t just cosmetic — it’s essential for good health, too. Why is sun protection so important in the fall and winter? During the summer months, the importance of sunscreen cannot be understated. When the weather is nice, we spend more time outdoors, and wear less clothing. We swim more, sweat more and towel off more. All of these factors make our skin particularly vulnerable to the sun’s rays in the warmer months. While most tend to think of SPF as a summer essential, it's equally important all year-round. UV rays are just as harmful during the winter as they are in the summer. What’s more, UVA rays can penetrate window glass. This means you are exposed to harmful rays during your drive to work and even at your desk if your office is filled with natural light. While you might not think it, UV rays are especially harmful on snowy days, since the rays are multiplied by the reflective nature of the snow. A common myth is that people who don’t burn easily don’t need to worry about sunscreen. Sunscreen is important for everyone. While light-skinned people are more at risk, skin cancer can affect anyone, no matter the shade of their skin. Again, the UV rays that cause sunburn aren’t the same as those that cause long-term sun damage, so make sure you’re giving your skin the protection it deserves for the future. How should I use sunscreen? If you’re using sunscreen, you’re off to a great start! But it’s also important to make sure you’re using it properly. Before you apply, be sure to check the label. Most sunscreens are marked with an expiration date. After this time, the sunscreen won’t be as effective. It’s best to apply sunscreen 30 minutes prior to sun exposure so the SPF has time to bind to the skin. To be sure you’re getting the full coverage the label is advertising, you’ll need to put on a thick layer. Studies show that most of us do not apply nearly as much as we should — it seems like moms around the world have had it right all along! Researchers advise applying approximately one ounce of sunscreen to get the full coverage. Then, it’s essential to reapply every two hours. Reapply even more frequently if you’ve been swimming or sweating. It’s also important to note that some SPF sunscreens are water-resistant, and fare better with a day on the beach, while others will wash off upon contact with water. Either way, you’re safest when you reapply consistently while out in the sun. How is Sun Protection Factor calculated? If you've ever wondered what the SPF number on your sunscreen bottle means, it stands for Sun Protection Factor. SPF ratings start at 2 and can reach as high as 70. Here’s how Sun Protection Factor works. SPF measures a sunscreen's effect against UVB rays and the amount of time you can be in the sun before burning. If, for example, you burn after ten minutes of sun exposure without any cream, an SPF of 15 will allow you to stay in the sun for up to 150 minutes without burning. SPF 75 means you have stronger protection for a longer period of time. So higher SPF means the sunscreen has higher protection, and that you can stay out in the sun for a proportionately longer time without burning. Remember, though, skin damage from sunlight builds up with continued exposure, regardless of whether or not sunburn occurs. Which Sun Protection Factor should I use? If you're looking for everyday UV protection, take a peek at our UV PLUS Anti-Pollution Sunscreen Broad Spectrum SPF 50 Multi-Protection. Our strongest sunscreen for face, this product contains Clarins’ exclusive Anti-Pollution Complex, which protects your skin from harmful pollution. Can I wear a high SPF foundation instead of sunblock? Depending on the amount of time you spend in the sun, the answer is probably yes. A high SPF foundation, like Clarins’ tinted sunscreen, offers UV protection for daily use. 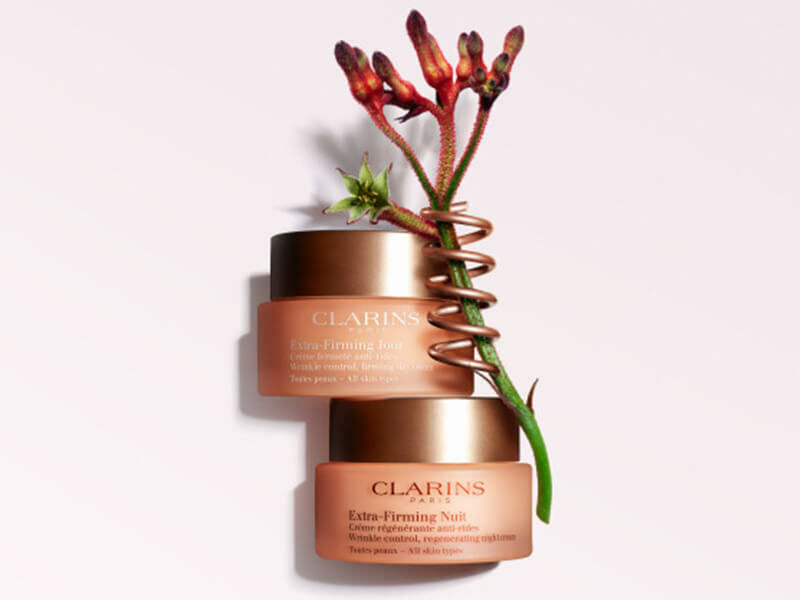 For more coverage, Clarins’ Everlasting Cushion Foundation SPF 50 is a buildable, moisture-rich cushion foundation that lasts all day. Its ultra-fine texture allows skin to breathe while instantly concealing imperfections. The easy compact is designed for convenient on-the-go use. While SPF 50 offers strong sun protection, some days might not require as much protection. If you’re just walking from your car to the office and back, or meeting a friend for a quick lunch at your favourite, sun-soaked cafe, a lightweight SPF 15 might suffice. Clarins’ Extra-Firming Foundation SPF 15 is a creamy, rich, oil-free foundation that results in a visibly younger-looking complexion. We know that sunscreen on the face is essential. But it’s just as important to wear sunscreen on all exposed areas of skin. This includes your forearms, tops of hands, ears and tops of feet. These areas are some of the most vulnerable, as we often forget to cover up. Who invented Sun Protection Factor? Sunblock has existed in some form or another for centuries. The ancient Egyptians used ingredients like rice bran, jasmine, and lupine as sunscreen. Rather than worrying about UVA and UVB rays, the Egyptians preferred to keep the skin lighter for cosmetic purposes. Of course, sunscreen has come a long way since the days of the Pharaohs. Many methods were attempted over the years, but the sunscreen that changed everything came along in the 1940s. In 1938, a Swiss chemistry student named Franz Greiter suffered from a sunburn while climbing Mount Piz Buin. He decided to act and got to work on formulating an effective sunscreen. At the time, the sunscreens that were used were mostly thick and heavy, serving as a physical barrier to protect the skin. In 1946, Franz Greiter finally released his sunscreen under the brand Piz Buin. It was called Gletscher Crème, or Glacier Cream. In the 1970s, Greiter’s brand released sunscreens with UVA and UVB filters. During these times, however, Sun Protection Factor was not measured. In 1956, Rudolf Schulze devised the Schulze method. The name of this method was changed to “Sun Protection Factor (SPF)” by Franz Greiter in 1974. What else can I do to protect my skin? To go above and beyond in the skincare department, there are a number of measures you can take in addition to wearing sunscreen. Wear protective clothing. If you can, cover up with long-sleeved shirts and pants. Keep in mind that some garments (especially light-colored articles of clothing) have less UV protection than others. Sit in the shade. Choosing a seat in the shade offers added protection from the sun. Bring an umbrella or choose a shady spot. Keep in mind that not all umbrellas have high SPF, so you’ll need to wear sunscreen, too. Wear a hat. To get optimal protection, choose a hat with a brim that goes all the way around. While we love the look of a straw hat, a hat with a tighter knit offers better sun protection. Stay out of the sun in peak hours. The sun's rays are strongest from 10AM to 4PM, especially during the late spring and summer. It’s best to limit your exposure during these hours. Of course, this is prime beach time! Don’t go outside without proper protection, and make sure that you’ve got enough sunscreen to reapply often. Wear sunscreen, even if it’s cloudy. UVA and UVB rays piece through clouds, so there are more harmful rays than you think. Be sure to remind yourself to reapply every two hours! Your skin will thank you. Ready for a day at the beach, a sunny weekend lunch or just need to ensure your skin is protected from the sun all year long? Browse our range of SPF products here.